very good quality rug. had it for 2 years now This user was entered into a sweepstakes after submitting their honest review. 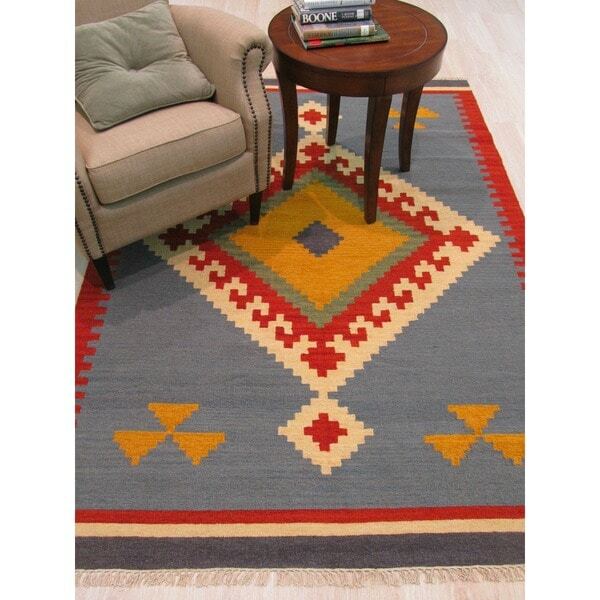 Create a sophisticated atmosphere in your home or office with thisHandmade Wool Keysari Kilim Rug. A dense, thick pile of colorfulwool highlights this beautiful rug. Do not buy this rug unless you don't mind gaps in a rug. Ridiculous. Just as pictured. Love the colors! Love this rug. I ordered it for our 70's style knotty pine wood-paneled basement. I was looking for ways to play w/ the retro feel and make the paneling look better. This rug was a great addition. It is true to the photos. Didn't shed at all. Love the design. But very scratchy/uninviting. Hello minimal shopper, this lovely rug does feature a Blue primary coloring. Thank you for shopping with us.